Some music is made to zone out to. For me, this type of music is usually music that I describe as “dreamy,” with a few consistent elements present, like big, loopy guitars, faint, oft unintelligible, layered lyrics, and an overall cohesiveness. In order for the listener to achieve maximum spaceyness, everything needs to come together into a single ear-pleasing sound. 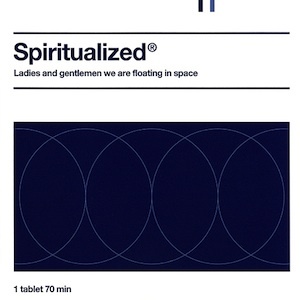 Spiritualized have mastered the art, as can be seen on their 1997 album Ladies and Gentlemen we are Floating in Space. The name of this album is great for a couple of reasons. Not only does it serve as a stark reminder that we just don’t matter all that much; it also describes the feeling you get when you listen to the record. I had to shake myself out of a dream-like trance multiple times while listening to the album, mainly during songs like I Think I’m in Love and Home of the Brave, two examples of dream-rock at its finest. The best song on the record doesn’t fit in with the formula, though. The album opener/title track is a really engaging song, in contrast to the rest of the zone-out tunes on the record. Layers of vocals pile up on top of each other beautifully, with blaring horns going off in the background, creating a unique and inventive song. At 70 minutes long, the album does drag at points. The second half, excluding seventeen minute closer Cop Shoot Cop, can get pretty boring. Cool Waves and Broken Heart start out uninteresting, continue with that trend, and go on for way too long. Ultimately, I’m being a little nit picky. The majority of the album is amazing, with relatively little fat that should have been trimmed.